THERE’S nothing quite like a holiday that makes you feel far removed from the rest of the world – and the island of Skopelos looks like a Greek paradise where you could truly switch off. I fell in love with the idea of Greece while studying Captain Corelli’s Mandolin for A Level English Literature, with Louis de Bernier’s beautiful descriptions of Greek islands and colourful characters. I’ve watched Amanda Seyfried and Meryl Streep sing their way through their relationship troubles more times than I can recall (isn’t Mamma Mia on TV every week?!). And I love Greek food. But I’ve only actually visited the country once. A few years ago we spent a week in an all inclusive resort just outside Kos town, which isn’t exactly an authentic Greek experience. I feel like I’m ready to explore a new country, and Skopelos, which incidentally is where Mamma Mia was filmed, looks perfect. Sparkling blue Aegean Sea, white washed houses, and clear skies – what more could you ask for? This is an obvious one when visiting an island, but what I like about Skopelos is that the majority of beaches seem to be pebble beaches. Ok, so there’s no sandcastle building, but there’s the huge bonus of no sand in little shoes, no sand sticking to sun cream, and no sand thrown in your eyes! You might be able to tell that despite living a mile or so from the beach, I’m not a huge fan of sand! Pebbles are fab for throwing in the sea, looking for fossils and collecting different shapes. 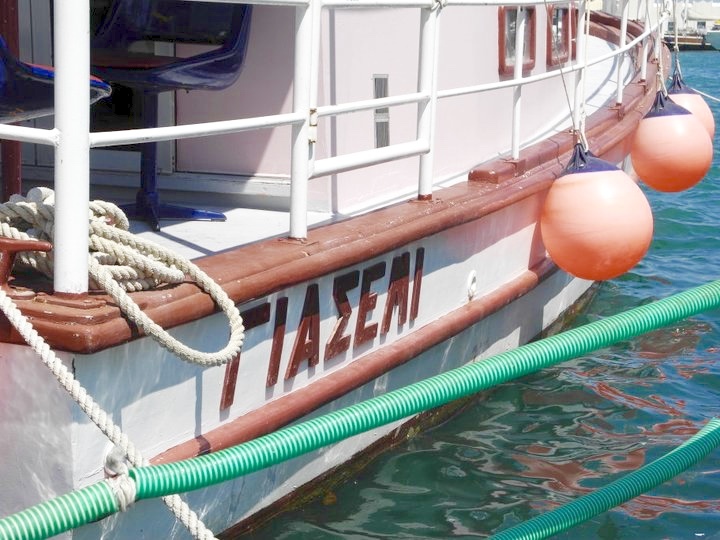 There are glass bottom boat trips that go from Skopelos Town, which look great fun. I love the sea, and trained in scuba diving while I was in uni so I have a fascination with different fish. Stew isn’t a fan of the open water, so a glass bottom boat would be a good compromise. I’m sure our boys would love looking through the glass to see all the different sea creatures. Ok, what I really mean here is amble along the cobbled streets, stop off for a bite to eat at a taverna and take in the sights of terracotta roofs leading to the sea. But … if you have children. they’ll love the tale of pirate Barbarossa, who almost completely destroyed the Venetian fortress at Kastro. Views for you, adventure for them. Everyone’s a winner. I don’t know about you, but I love finding out that there’s a local festival on while we’re on holiday. Years and years ago me and Stew found ourselves following a religious parade in Majorca, we’ve been to a really small music festival with our boys in France, and we watched a mini carnival in Cuba while on honeymoon. It’s such an interesting way to find out more about the country’s culture. Skopelos has loads of festivals – celebrating the life of a musician, processions and all night parties at the end of summer, and most intriguing – the plum festival! If you time your holiday right you can experience both the summer and plum festivals in one trip – bonus! As I mentioned, Skopelos (as well as neighbouring island Skiathos) was the location of Mamma Mia, so there are plenty of photo opportunities for fans of the film. The wedding scene was filmed at Agios Ioannis at Castri (below), the beach is Kastani, and the view from the house is from the area Nisi Glisteri. These steps might be a bit of a struggle for little legs, so maybe one for older children (or parents with strong arms!). The climb must be worth it for the view! 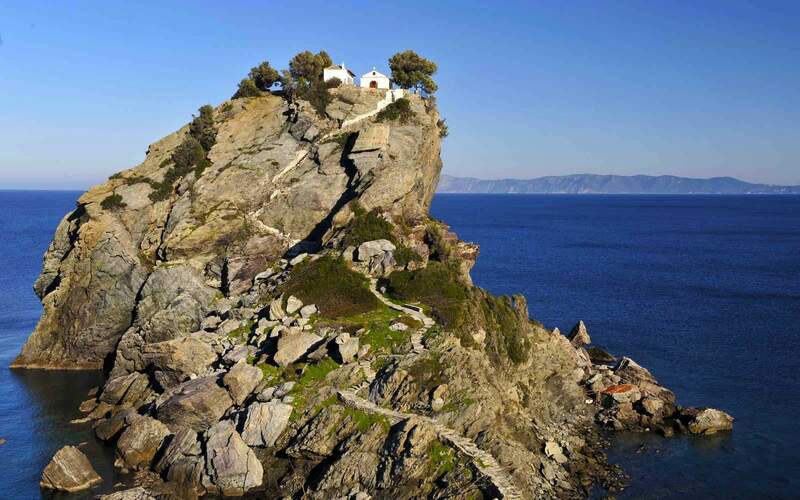 You can get up-close to the marine life in Skopelos at the National Marine Park near the offshore island of Alonnisos. The seas host dolphins and a tiny colony of monk seals – rare creatures that are facing extinction. Excursion boats leave from Skopelos Town and, as well as blowing the cobwebs away, you’ll get the chance to see pods of dolphins swooping around the boat. 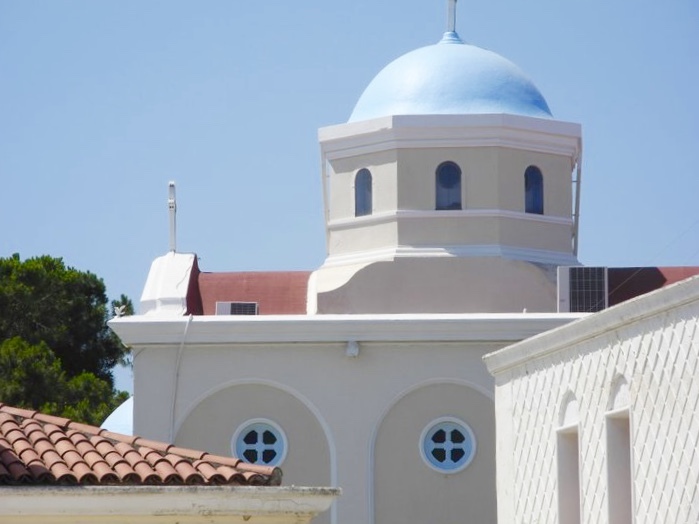 There is no airport on Skopelos – the nearest is on neighbouring island Skiathos. You can pre-book a hydrofoil, which takes 20 minutes, and disembark at either Glossa or Skopelos port, depending on which side of the island you are staying. I have never been to Greece but would really love to visit – so many places but they all look stunning. That view on the top of the Mama Mia island – wow! It really is a stunning view, isn’t it? I have only ever been to Rhodes but it was amazing.